I have been reading the book Telling Ain’t Training by Harold D. Stolovitch and Erica J. Keeps, a combined ASTD and ISPI publication. This is a must read for all trainers, performance analysts, and learners. This is a short, seemingly easy read but packed with practical advice, analytical insights and great suggestions from these experienced trainers. I have planned to document a few points in my blog for future reference and to capture my reaction to the book as I read it. I may also go back and revise some of these posts, but recording my thoughts now. In this post, I am going to discuss what Harold and Erica say about declarative and procedural knowledge and the novice-expert divide. 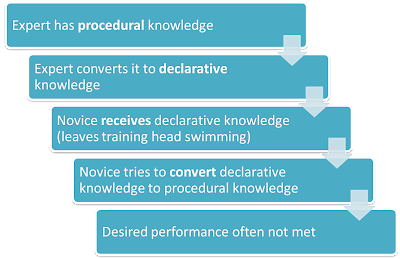 Declarative knowledge is about describing how things are done, what we see, and what we know. This is a uniquely human skill. No other living being is capable of describing what they do or know, they “just” do. Procedural knowledge is about “doing.” It is, as the term implies, the process of doing, like typing without looking at the keyboard, cycling, driving. Most experts “know” how to do something (whatever it is that they are deemed to be experts in). They have acquired this expertise over the years by doing, by applying. With increasing expertise, their views of situations and ability to assimilate, analyze, synthesize evolve and change. They begin to “see” the world differently from a novice. For an expert, the information coming their way is grouped in larger and larger interconnected bits. Whereas, a novice gets mired in the details because, for them, each piece of information is a separate bit. They soon go into information overload mode without a clue as to how to connect the small pieces to arrive at the big picture. Their short-time memory rapidly fills with disjointed bits of relevant and irrelevant information in equal abandon. When does the divide occur? When an expert is expected to convey information to a novice in a manner that will enable the latter to translate that information into performance output. For great examples, you must read the original. The experts are what the authors of Made to Stick call, “Cursed with Knowledge.” They are unable to view the world from the perspective of a novice who receives and processes the same information very differently. It is very difficult to imagine what it is like not to know once you know, if you know what I mean. So, when an organization takes an SME (the formal term for experts) and asks them to communicate their knowledge to the novices and hopes for performance improvement, there is a major gap although both the sides are trying very hard. Yes, it can and this is where, we as Performance Analysts and Instructional Designers come in as facilitators in the process. “Learnable” information is a term I use to describe that which is not about “telling and transmission, but about training and transformation” and performance. 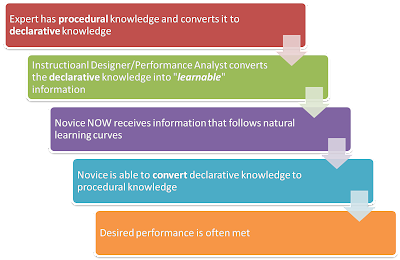 In my next post, I will describe how declarative knowledge can be transformed into “learnable” information that can impact performance. Below is an image showing a few examples of how declarative knowledge can be coded to become "learnable" information. Watch this space for more snippets from Telling Ain't Training.